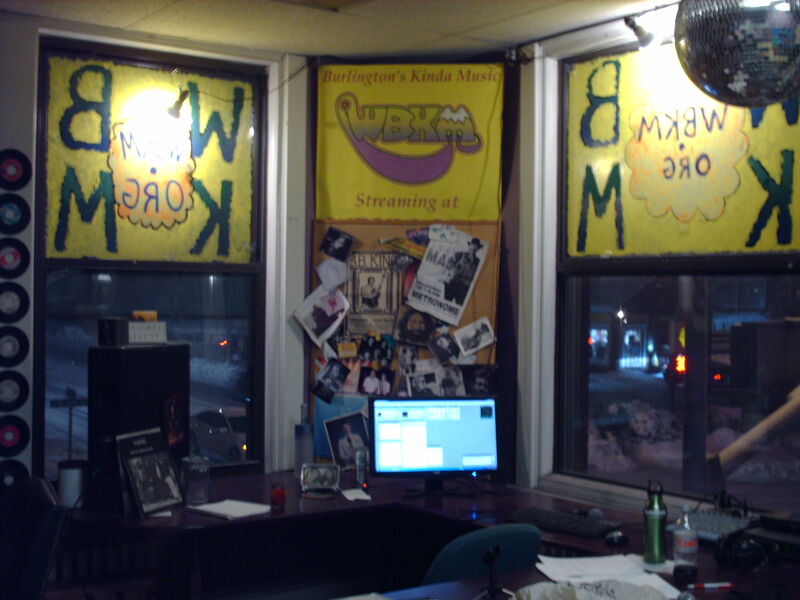 I just got back from my local music radio show on internet only Wbkm.org. It was kind of rocking and kind of mellow and kind of really rocking. From our small city to the great big world, these are the Sounds Of Burlington. Let’s begin tonight by thinking about the cosmos and our place in it and what makes us different and what makes us the same. I love the imagery in that song. It’s nice to look up at the stars and realize that we all look at the wold from the perspective of one person going through it, which lets you understand how similar we all really are. I think all of those songs made that point in different ways. There is lots of music going on tomorrow and I will miss most of it since I have a ticket to go see Intergalactic Nemesis at the Flynn with my brother. If I wasn’t doing that, I’d likely go see these next two bands at the Monkey House. Arc Iris are playing at Light Club Lamp Shop tomorrow. They are pretty incredible and always put on a stunning show. This next song is a new one that has me hooked. That was from a demo ep that came out before their one and only album. Great song from Aaron, who is a great guy and an amazing guitar player. Great new Elephants song! This next song is a new one that has me hooked. That was a fun cover of the Envy song by Barbacoa. Fun rocker from BB. I love the video for that one, which is shot at the OP. The Colin song has references to the Cave Bees and an alligator, so I had to play the Bees song. OK, here is the next song from Red Flannel Hash. Great song from the Lots who are headed to Europe again soon. Great song from Particles who come visit us from time to time. Classic rocker from Broccoli. This next song is a new and heavy and really cool song. That was pretty amazing. I love the way it steadily gets more intense. OK, let’s play some shorter songs, but still keep rocking. Great song from the classic punk rockers. Solid rocker from the Siberians. The Toes are so wonderful, you have to experience them live to really appreciate them. Great song from Vetica. OK, there is time for a couple of more songs. This next one is from a ’90’s band who broke up, then got back together to make a new album. Thanks to everyone who made tonight’s show possible. Thanks to Justin Ellis, The Color Exchange, The Church Band, Alice Austin, Julia Austin, Binger, Braden Winslow, Shakir Stephen, Dalton Muzzy, Joe Adler, Phil Yates & The Affiliates, Phil Yates, Jacob Blodgett, Raph Worrick, REDadmiral, Gordon Glover, John Billingsley, Arc Iris, Ray Belli, Elephants of Scotland, Adam Rabin, Ornan McLean, John M Whyte, Dan MacDonald, Aaron Flinn, Colin Nicholas Clary, Cave Bees, Steve Tremblay, Rebekah Whitehurst, Creston Lea, Blue Button, Eric Olsen, Jason Cooley, Jeremy Frederick, Black Rabbit, Darlene Scarano, Marc Scarano, Jane Boxall Percussion, The THE VACANT LOTS, Jared Artaud, When Particles Collide, Sasha Alcott, Chris Viner, Vultures of Cult, The Toes, Pam Ant, The New Siberians, Ted Pappadopoulos, Brendan Devitt, Eef, Jedd Kettler, The Mountain Says No, Andrew Frappier, Ben Maddox, Fish, Active Heed, Bernie Sanders, Seth Yacovone Band, Bob Wagner, Waylon Speed!, Kelly Ravin, The Cush, Burette Douglas, Gabrielle Douglas, Marillion, Steven Rothery, Ritchie Blackmore Official Site, jane siberry, Arc Iris, Kate Bush, Iron Maiden, Joshua Glass Music, Kat Wright & The Indomitable Soul Band, and everyone else!! I just got back from my local music radio show on internet only WBKM.org. It had a nice start and a heavy end. From our small city to the great big world, these are the Sounds Of Burlington. It’s a crisp Autumn night, it’s cold if you are standing, but not bad if you are moving. This week a wonderful local musician named Samara Lark Brown lost her mom. Please send her lots of loving energy as she spends time with her family. It seems like there have been lots of sad events lately, and wonderful events lately. We are spirits condensed and incarnated for a finite amount of time. As you go through joy and pain, be sure to not bottle it up. Feel it and let it out, so your friends and family can help you. The healing process seems to have times of pain and times that are more bearable. This first song deals with the waves of emotion that keep on coming. This is In Waves by Sarah Blacker on WBKM and this is Burlington’s Kind Of Music. That beautiful song goes out to Samara. That’s her singing and Johnnie Day Durand on saw. It was so great seeing Joe and Johnnie at Radio Bean on Tuesday. Samara also sings with Wave, who may have a show coming up in the near future. What a stunning song by Anachronist! Nicely explained Sarah. OK, let’s play the next song from No Need To Beg. Another great song from Linda Bassick‘s Friday Morning Sing Along album. Great song from the Siberians first album. Can’t wait for the next one. Lovely song from Lendway. I saw 3 of the guys at Metal Monday at Club Metronome playing surf rock as The High Breaks. It was a great rocking set. One of Phil’s affiliates, Raph Worrick is playing with Jane Boxall Percussion at Light Club Lamp Shop Saturday under the name Bad Smell. Jeremy Gilchrist is also playing that night, so it should be fun. OK, it’s late on a Thursday and almost Friday. Does anyone want to come and freak out with me? I was just listening to Plains and that one jumped out and I wanted to play it. Killer rocker from Barbacoa. Wobble played Higher Ground last week and played a killer version of that song. When I played it last Thursday I could just hear it coming out of Friday. They mixed as well as I hoped. This next band have a new song on the Endless Bummer compilation. Killer song from their Oppenheimer Quotes Vishnu EP. One of the guys in the band is part of the Metallica tribute band playing Monday at Metronome. Love that Vetica song. I definitely need to check out Carraway again. Doom are playing next Wednesday at Finnegans with Dino Bravo VT. Let’s go back to the ’90’s with a seasonably appropriate song. All of those are classic Burlington songs. I just love this next song and hope you do to. The Lots started by playing in town and now play all over the world. Admiral are at Radio Bean tomorrow and I really need to check them out. Particles tour a lot. Check them out if they come to your town. I saw this next band at Metal Monday a couple of days ago and they rocked hard. Killer song from Casey Merlin Rae, who used to play in lots of bands in town. Well, I hope you enjoyed checking out the music of our town. Let’s do it again next week, shall we? Goodbye. Au Revoir. Arrivederci, Adios.